Have you optimized and fine-tuned your Twitter bio to perfection? When setting up your page, did you just click through all the steps as quickly as possible? You don’t need to put hours and hours into creating your bio because the fact is that there isn’t a lot to do. However, many brands put less time into their bio than they should, and by just giving your bio some though, you’ll soon be able to see results. Your username can be maximum 15 characters and must be completely unique, meaning no one already using it. Your name, on the other hand, can do not have to be unique, so if your brand’s name is taken for the username, at least you have your regular name to lean on because it is actually searchable. Your username and name don’t have to be the same. 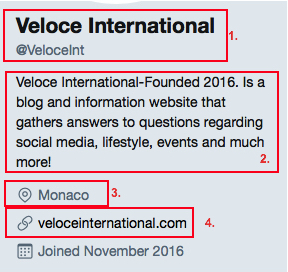 The most effective methods that you can see a lot of brands doing is to use the name that most people will search on in their official Twitter handle, and then in the name “explain” further what they are”. Ford is a good example of this. 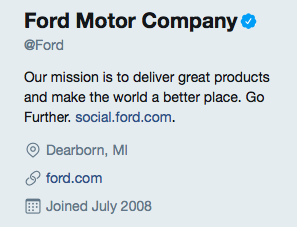 Their username is @Ford, and their name is Ford Motor Company.Ford, and their name is Ford Motor Company. You can change your Twitter name whenever you’d like by going to your profile and selecting “Edit Profile”, or going to the settings tab. You can only change username through the settings tab. This feature is truly helpful for a lot of brands. Let’s say they are doing a rebranding, or for any other reason need to change Twitter username, it is easy to change the Twitter handle. When changing your username, it will tell you if it’s already taken or too short. If you are to change your username, just make sure you inform your audience, because otherwise, they might send Tweets to your old handle. In addition, it’s also recommended that you include unnecessary underscores, dots, and numbers because this will make it harder for people to find and remember your account. Here’s where it’s time to get creative. Your bio can only be 160 characters, so you need to choose your text very carefully. 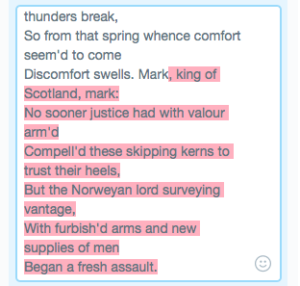 Knowing when you are out of characters is really convenient because if you surpass the 160 limit, all the letters you continue to write will be marked in red. Your bio is normally the first thing people see when visiting your profile, so obviously, you want to make it as appealing as possible; while also including all the necessary information about your brand. In addition, your bio can even show up in search engines. For example, by optimizing your page for search engines, you can get your Twitter profile to show up high in the search result, thus giving you greater exposure. There are quite some ideas that you can use when writing your bio, however, it’s important that your bio describes your business, and show your brand’s personality. The last one is optional. There really are endless ideas, and once again, it comes down to how you want to portray your brand. No matter if you have a physical location which customers can visit or just have an office that does not accept visits, you can include the city of your location. Doing so makes you seem more approachable, and it also creates a connection between the individuals who are close to that area. Since your bio is above the website link in your profile, you can, as mentioned earlier, add a call-to-action button pointing people to your website link. Twitter is a powerful tool for driving traffic, but by using methods like these, it can be even more powerful. Did you also know that you can add a website link in your bio? This means twice the links compared to only adding it in your website section. In order to track traffic generated from Twitter, and to share shorter links, you can use a link shortening service like Bit.ly. Now that we’ve gone through the most important parts of your Twitter profile, let’s go more in-depth on how you can create appealing bios because really, it’s the bio that matters. Now, creating a bio that is appealing while also including all necessary information is not an easy task, but not impossible. If you read some Twitter bios, you’ll soon realize that most of them are boring and contains nothing that piques visitors’ interests. But you shouldn’t be one of them. A simple way to get people interested and engaged can be to just include a question. You want your bio to reflect your brand, and what it’s all about. You certainly don’t want to make it look like it has been written by a robot. Unfortunately, though, that’s what a lot of brands’ bios look like. Not only do you want your profile to show up in search engines, and ultimately get more exposure. You also want it to show up in Twitter searches, and keywords help you do that. Include keywords that are relevant to your brand, but do not make them look desperate. Also known as keyword stuffing. You want your bio to read properly and not look artificial, so all you need to do to know if you’ve included keywords successfully is read it and see if the sentences are a mouth full. There are many components of a successful Twitter profile, but the single most important part of a Twitter profile is your bio. Your website link drives traffic and your location tag lets people know where you are based, however, your bio is what people will read, and what will (hopefully) spark their interest, so obviously, it’s the part that you want to spend the most time on.